Home > AMT Blog > Sonny Turner Brings Classic Hits to the American Music Theatre August 6! Sonny Turner Brings Classic Hits to the American Music Theatre August 6! Sonny Turner has lent his distinctive vocals to several rhythm and blues bands over the years. 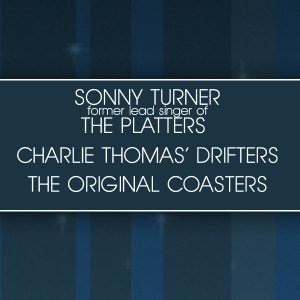 Monumental musical groups, like The Platters, Charlie Thomas’ Drifters, and the Original Coasters, have all featured Sonny. His most beloved performances originated from his work as the lead singer of the Platters – of which he is the only surviving member. You won’t want to miss the classics from these incredible bands. The Platters’ signature songs include “Only You”, “The Great Pretender”, and “The Magic Touch.” Charlie Thomas’ Drifters “Under the Boardwalk” captures the jovial nature of youth with its upbeat tone. Decades of hits make The Original Coasters unforgettable. Fans will remember classic hits like “Charlie Brown” and “Yakety Yak”. This show is packed with classic hits from the man who helped bring them to life. Join us on Sunday, August 6 at 3 p.m. for an afternoon with Sonny Turner. After replacing Tony Williams in 1959, Turner breathed new life into The Platters. With Sonny Turner as their lead singer, The Platters recorded just under 400 songs and sold over 80 million records. He recorded new hit singles such as “I Love You 1000 Times,” “With This Ring,” and “Washed Ashore.” He also re-recorded many of the older Platters hits of the 1950s. Sonny Turner left The Platters in 1970 to pursue a solo career – and continues to perform all over the world. His vocals appear on contemporary soundtracks for The Nutty Professor 2, Hearts in Atlantis, and Prince of the City. In 2005, he received The Lifetime Excellence in Entertainment Award from consumer’s entertainment exchange and the Doo Wop Hall of Fame. In 2008, Turner accepted The Gateway Classic Lifetime Achievement Award. He also received a star on the Pacific Avenue of the Stars in Wildwood, New Jersey in 2009. Sonny Turner received inductions into the Beach Music Hall of Fame and the Vocal Group Hall of Fame. The Rock n’ Roll Hall of Fame in Cleveland, Ohio added their recognition to Sonny Turner’s long list of awards and achievements. In 2013, The State of West Virginia and Senator A. James Manchin honored Sonny with his induction into the Hall of Fame. With accolades like these and major classic hits under his belt, Sonny Turner is a music legend. Contact American Music Theatre today to reserve your tickets. You don’t want to miss this amazing show!